Made of premium quality stainless steel with robust legs that are perfect for home and business usage. 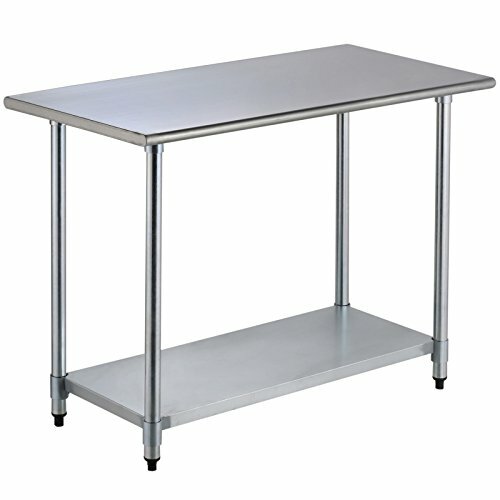 It designed with adjustable under-shelving for extra storage height that is perfect for uneven floor makes this kitchen workbench is practical and reliable, and easily flat-packed for portable and on-site work. A sturdy and solid built, durable worktable bench provides an excellent foundation for your kitchen work, which can be used as a permanent installation. Quick set up:Assemble fast and easily.Safe rounded front and rear edge, with square side edges for superior comfort. If you have any questions about this product by SUNCOO, contact us by completing and submitting the form below. If you are looking for a specif part number, please include it with your message.